"It focuses a lot on the practical side of filmmaking, and allows you to think independently and creatively," he says. "The staff are very methodical and some of them have made inspiring films themselves. The course itself ws also just what I wanted; not many universities have such a creative media course. And of course, if you want to make it big in the media world then London is your best bet." The reality of the course has lived up to those expectations, and Lewis feels that the course and creative environment at LSBU has helped him to think in new ways. Those ambitions are certainly things that Lewis has already begun to achieve, even while still studying for his degree. "My good friend Raphael Fox and I set up an independent production company to work together on films of all genres," he explains. "One thing we really wanted to tackle was the world's perception of gender – being transgender ourselves, it's something we feel passionate about." The fruit of that labour was a film project entitled 'My Genderation'. The films explore gender variant individuals in a way that the mainstream media has never done before. "We put our heart and souls into each film, and have met many amazing people along the way," says Lewis proudly. "The films have been screened at various events and exhibitions, as well as in schools and university." Lewis then became aware of the BBC Fresh initiative, where films would be showcased on the BBC website with the possibility of being broadcast on BBC3. The duo submitted their most recent effort, 'New Genderation'. It tells the story of Tayler, a 14-year-old who was born in a female body but identifies as a male. "The BBC loved the film, and even put up a filmmakers profile for us up on the site," says Lewis. "We're really hoping that this will open lots of doors for us. We want the films to spread far and wide, as well as getting our names out there in the filmmaking world. We're hugely grateful to everyone who has supported the films – it's an ongoing project so who knows where it will take us next!" 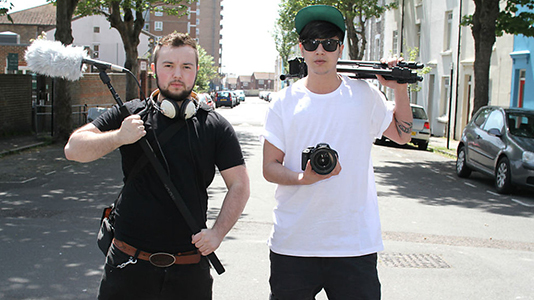 The project saw Lewis listed in The Guardian as one of the top 30 young people in digital media, which described 'My Genderation' as "a key voice in the movement to educate and publicise issues around gender variance," but Lewis and Raphael have no intention of resting on their laurels. The pair are already involved in a project run by On Road Media called All About Trans, whose aim is to help the media portray a positive representation of the transgender community. As well as giving Lewis the chance to promote an agenda he is passionate about, it is also providing him with valuable professional experience. "The first phase involved interacting with media professionals such as head executives at the BBC, and the next phase will incorporate my filmmaking ability." With a bright future ahead of him, Lewis believes that his time at LSBU has helped to prepare him for the career he has always dreamed of. "It has taught me a lot in terms of technical skills and how to use specific buts of equipment, but it has also got me thinking in new ways," he says. "LSBU is helping me to develop my ideas and skills, as well as providing some great contacts too. If I can win some film festivals or get a show commissioned for broadcast, then I will feel I have really 'made it'. Since I started at LSBU, I can honestly say I've never felt more enthusiastic and determined to make something of myself."